Barkby returned disappointed they did not convert excellent performances from Townsend, Kirk and Drake into victory at Enderby on Saturday. After captain Steve Flowers had won the toss and put the home side into bat, opening bowlers James Kirk and Chris Pick each took a wicket, Kirk bowling Coulson for 12 and Pick bowling Coughlin for 18. Enderby’s innings then progressed from 58-2 to 113-3 before spinner Townsend came into the attack. In his second over he had the hosts’ overseas player Buys caught behind by Waplington for 34. Townsend then took two wickets in his fourth over, Shipley well caught by James Kirk for 15, and opening bat Patel caught by Smithard for 49. Smithard came on to bowl and the youngster took two wickets in his sixth over, bowling the dangerous Mackey for 23, and having Johnstone caught by Flowers for one. Townsend then finished off Enderby’s innings – all out for 192 – when he had Daley stumped by Waplington for four. Barkby’s innings began disastrously with Flowers (9) and Hollis (2) both clean bowled with the score on 13. Townsend (11) was the third wicket to fall with the score on 42, but Ian Kirk (61) and Jamie Drake (64) got the innings back on track, and when Kirk was out with the score on 162, Barkby were firm favourites. Robinson was bowled first ball and Drake followed, leaving Barkby still needing 31 runs for victory with 10 overs left. 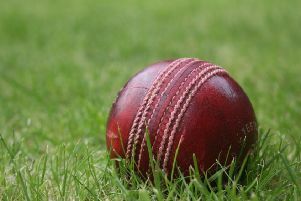 Despite Waplington’s unbeaten 13, the visitors fell four runs short of their target as both sides took 15 points from the draw. Bowling: J. Kirk 5-0-28-1; C. Pick 8-0-26-1; I. Kirk 7-0-22-0; J. Drake 7-0-44-0, R. Townsend 10.2-3-36-5; A. Smithard 7-0-30-2. Barkby: S. Flowers 9, B. Hollis 2, R. Townsend 11, I. Kirk 61, J. Drake 64, T. Robinson 0, M. Harby 8, R. Waplington 13*, J. Kirk 1, A. Smithard 0, C. Pick 0*, Extras 20. Total: 189-9.